Super Mario 64 was a launch title for the N64 and it was also the first 3D platform game to star everyone's favourite Italian plumber. In this game, Princess Peach and her servants have been kidnapped and it's your job to recover the 120 Power Stars by completing missions to unlock new areas and eventually topple Bowser. It takes place in and around Princess Peach's castle and there are 15 different levels including Cool Cool Mountain, Big Boo's Haunt and Rainbow Ride. Each level has six different missions and you can complete them in any order you like. In fact, the whole game adopts a very open world approach, and it encourages you to explore rather than sticking to a rigid path. The controls are fluid and before you know it you'll be back flipping, long jumping and wall kicking your way around the castle with ease! Although the camera can occasionally cause problems, Nintendo did a fantastic job considering the monumental transition from 2D to 3D gaming. Audio is another of Super Mario 64's many high-points; from Charles Martinet's unforgettable voice-over in the intro ("It's-a-me, Mario!") to the music which perfectly suits each level, the audio really helps to draw you further into the world. Random trivia: If you don't own an N64, check out the Nintendo DS remake of this game. 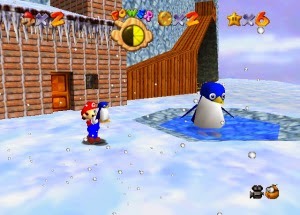 It introduced Luigi, Yoshi and Wario as extra playable characters and includes a number of new areas to explore.